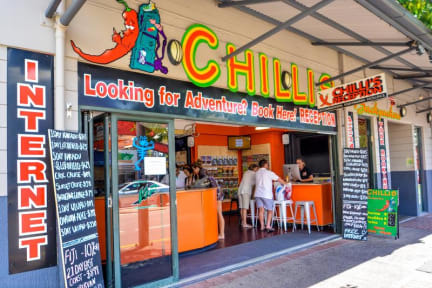 Providing air-conditioned four, six or eight bed dorms, Double or Twin private rooms (Shared Bathroom), Chillis is a tranquil backpacker haven nestled in the very centre of Darwin. Free WiFi. Cool off on the first floor rooftop sundeck after a day out adventuring! Featuring beautiful hanging gardens and two huge brand new spas, soak your miles away, catch up on that book you've been meaning to read or just get your tan on. At the front of the property, a communal kitchen and dining area sits on a covered balcony overlooking Mitchell St. Cook a meal, watch a movie or just relax with friends. Added to all this, our experienced and helpful reception Staff can assist you with all your tours in the Top End. Ask about our amazing deals on single or multi-day tours to Kakadu, the waterfalls of Litchfield National Park, Uluru, if it's available we will get you on board.